Drop-down arrow: Use this icon to undock or close panels and frames. You can also use it to maximize frames. Click and Drag: Use this icon to move panels around the workspace. You can click and drag the panel by placing the cursor over the Click and Drag icon at the far right, as indicated in this figure. 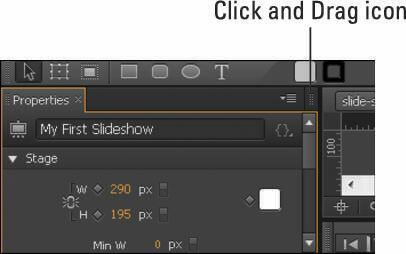 The Click and Drag icon for panels. You can move each panel into any onscreen position and location, whether by clicking and dragging the name of each panel or clicking and dragging its icon.